You've just redesigned some pages of your web site. The pages have high search engine rankings that you don't want to lose. How can you safely redirect web site traffic from your old pages to the new pages without losing your rankings? You can do this by using a " 301 redirect " So , What actually is this “301” ? 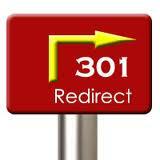 A 301 redirect allows visitors and search engines to access a web page after it has been moved. If you have changed the domain name of your web site or changed the file names of pages, then you need to link to the new URLs for visitors and search engine spiders. The 301 permanent redirect is the most search engine-friendly method of redirection to the new URL or page and is the current standard for SEO purposes. The Canonical 301 Redirect will add (or remove) the www. prefixes to all the pages inside your domain.